Abstract: Neturon stars are the fastest rotating stars, rotatıng at rates up to 714 Hz. This arises from extreme properties of very condensed matter. 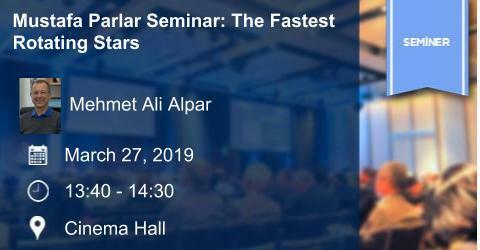 BIO: M. Ali Alpar: BS METU 1972, PhD University of Cambridge 1978. Professor of Physics at Sabancı University. Founding and current president of Bilim Akademisi - The Science Academy, Turkey. He has made contributions in theoretical astrophysics, to our understanding of superfluid dynamics in neutron stars, to the explanation of the fastest rotating stars, the millisecond pulsars. His current research focuses on neutron star glitches and on neutron star evolution with fallback disks. Member of the Academia Europaea and an international member of the American Philosophical Society. Member of the Science Board of the Scientific and Technological Research Council of Turkey (1993—1994), Member of the Council of TUBA (1993-1997) - resigned from TÜBA: 2011. Member and former president of the Turkish Astronomical Society; Member of the European Astronomical Society and the International Astronomical Union. © Copyright 2013 Sabanci University.